The Model Number is CC 500 and it is a Cub Cadet. It was the first lawnmower I have ever purchase. I have a small 5000 Square lot that take about and hour to push mow. I had it low and it chopped the grass down to nothing. The control lever works great and I have since raise the deck so not to cut the grass too low. The Fact that it can be a mulching, side shooting, or bagging mower is great. I usually mulch my grass, but when I have do not get around to mowing every week I can easily bag up the trimmings. To unload the trap it is very easy. The handle makes the up, out, and dump very quick. I usually have to unload the trap about six times all said and done. That fills about 2 and a half 33 gallon trash bags. I have yet to use the side shoot. The gas is straight up no need to mix with oil. The oil reservoir is easy to get to and check and the start up is a snap. I am very pleased with my purchase and if you have a yard my size I would recommend it. Join in and write your own page! It's easy to do. How? 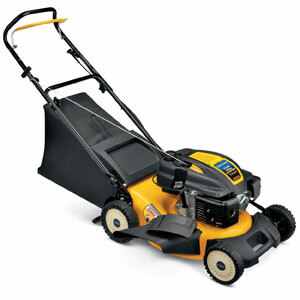 Simply click here to return to Cub Cadet Lawn Mower Consumer Reviews.